View of “Human Nature,” 2011. Visiting the grandiose neoclassical building that houses Haunch of Venison is perplexing and terribly satisfying this summer. Director of exhibitions Ben Tufnell has interspersed Richard Long’s solo exhibition “Human Nature” with Giuseppe Penone’s untitled exhibition. Their aesthetic visions fuse seamlessly. At the entrance, Long’s handprints in white clay materialize on black backgrounds in Untitled, 2010. They greet us from their dark settings like disconcerting, primitive symbols. Correspondingly, in Penone’s bronze sculpture Projection, 2000, a giant fingerprint floats between bare branches, as if this marker of individuality is in danger of disappearing into the wilderness. That Tufnell has not included wall labels intensifies this “who done it” game of identity. Until we read the accompanying text, the show simulates the atmosphere of a mystery novel. Despite their different orientations––Long helped to pioneer Land art in the 1960s, while Penone’s nature-sensitive offerings emanate from Arte Povera––this is not the first time their work has mingled. Friends since 1971, the artists have displayed their works together before. However, “the opportunity to show them alongside each other was something of a dream come true for me,” confides Tufnell, who notes that “both artists evoke complex ideas about time, nature, and humanity.” Indeed, in Propagation, 2010–11, Penone has placed an inky fingerprint on a white piece of paper, which is stuck on a wall. Black lines, extending onto the wall, encircle the central image. Eddying outward, these hazy rings could be the cross section of a tree trunk or wobbling ripples on water. They also appear to radiate energy, inducing an unexpected trance. Close by, Long interweaves the dance of time with timelessness. 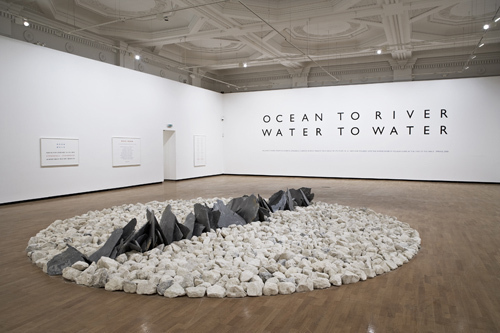 In Stone Print Spiral, 2011, gray-white pebbles from Danish rivers form a large circle on the floor. As viewers look past the installation, out the glass windows, we encounter statues of pompous-looking dignitaries sitting on stone chairs attached to the forbidding facade of the building. Has the circular configuration, residue of walks Long has been on, cast a spell on them? Time seems to stand still––as if visitors have stumbled into Sleeping Beauty’s castle before Prince Charming wakes her household from their stony slumbers.